Like any other edged tool, ikebana clippers naturally get duller with use. The only way to get around this is to sharpen the blades properly. The good news is we know the best person in Halifax for the job. Meet Peter Nowlan, owner of New Edge Sharpening. He has been sharpening knives the traditional way since the late 70's. He is passionate about knives and will sharpen each one with utmost care. We also found out that the traditional ikebana clippers can be sharpened in the same way! We have partnered with Peter and so now you can have your knives and clippers sharpened by simply bringing them to the shop! what's so special about this service? Peter is a craftsman in the truest sense of the word. He is meticulous and takes pride in his work. Each knife gets his full attention and is sharpened manually in the free-hand, traditional way. He uses the best quality Japanese water stones. He does not finish a job unless he is 100% satisfied. He will also repair minor nicks and chips on the blade at no extra cost! Note: We do not sharpen straight razors, scissors, swords, saws, ice skates or lawn mowers! how do I get my knives/clippers sharpened? Easy...if you are in Halifax! Just bring your knives/clippers to the shop and leave them with us. We'll inform you when they are ready (normally in a week or so) for pick-up. Note: Price changes effective from Feb 28, 2017. *Chip repair must be incorporated with sharpening order. Peter does his absolute best to minimize repair costs. In fact, many very minor repairs are included in the cost of sharpening. Note: If your knives or clippers need extra special attention, we will let you know the expected cost and obtain your agreement before starting any work on it. Improve the quality of your kitchen life and your ikebana practice now with sharper blades! Try us! 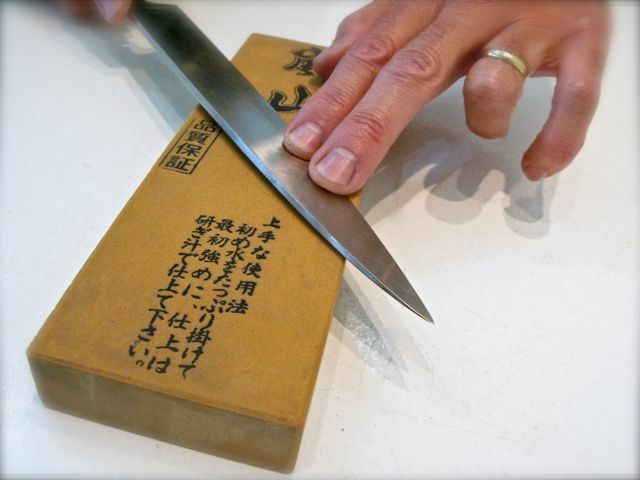 Interested in learning how to sharpen knives yourself? We can arrange a workshop for you. Click here. How soon can you get the job done? Peter normally will come to our shop Tuesdays and Fridays for pick-ups and deliveries. Expected turnaround time is a week after pick-up. For example, knives received Fri-Mon will be picked up on Tuesday and they can be expected to be ready the following Tuesday. If a job is expected to take longer, we will inform you as soon as we learn the expected completion date. Done-within-a-week is not a 100% guarantee but Peter is earnest and efficient in his work. We do our best. That's guaranteed!